← START A NEW PAGE OR KILL ONE? See my new page for a background to the terms above, I plan to report S snd/or S’s in posts. Here’s the first one which occurred about 1979 and involves my daughter Lili (sh ort for Little Liz). See her photo to the right. of religion, psychoanalysis, business, literature, and art. Originally a divination manual in the Western Zhou period (1000–750 BC), over the course of the Warring States period and early imperial period (500–200 BC) it was transformed into a cosmological text with a series of philosophical commentaries known as the “Ten Wings.” After becoming part of the Five Classics in the 2nd century BC, the I Ching was the subject of scholarly commentary and the basis for divination practice for centuries across the Far East, and eventually took on an influential role in Western understanding of Eastern thought. 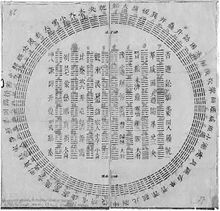 The I Ching uses a type of divination called cleromancy, which produces apparently random numbers. Four numbers, 6 to 9, are turned into a hexagram, which can then be looked up in the I Ching book, arranged in an order known as the King Wen sequence. The interpretation of the readings found in the I Ching is a matter of centuries of debate, and many commentators have used the book symbolically, often to provide guidance for moral decision making as informed by Taoism and Confucianism. The hexagrams themselves have often acquired cosmological significance and paralleled with many other traditional names for the processes of change such as yin and yang and Wu Xing. One day about 1980 my daughter Lili showed some curiosity about the I Ching, whch I had been playing with. I let her toss the coins and we were both surprised when it came out Lili/Lili. Not to be distracted by so strange an occurrence, I had her toss the coins again. Again, they spelled out Lili/Lili, whereupon, somewhat shaken, we put the book away. NEXT WEEK I’ll record another S/S, this one involving my youngest daughter. This entry was posted in Serendipity, synchronicity and tagged Serendipity, synchronicity. Bookmark the permalink. Thanks– I’ll subscribe to him if I can, but Word Press can’t be “shared with,” I think.